“Dear, Brother Knight…” is a phrase we hear a lot. This writer’s granddaughter and daughters have repeated it many times. There is a little kidding in the way they and we say it, but to a Knight and his family it has a far deeper meaning. For the last 25 years I have seen the men of the church pitch in to help one another. Long before we formed a council in the early ’90’s, the Men’s Club members were everywhere building and caring for our church and school. Some installed telephone poles at the new church school. Others wired telephones, ran water lines, planted trees, hung doors, moved furniture, helped the sisters and more. They were and are proud to be Catholic men and were eager to form our Council and expand their opportunities and their ministry of serving others. Everyone helped everyone. They often would hear of a problem, a need, a crisis, or a challenge. If they couldn’t solve the problem, they reached out to a brother Knight. Sometimes you would find a bunch of knights showing up to help each other. The call was out–a brother Knight or friend needed help. This writer has been the recipient of help too many times to remember. I had the honor last week to stand up in church to announce that Gene Drogos was celebrating his 90th birthday and 68th anniversary! As I was talking, he was looking my way and just looked humble, but proud that a brother Knight remembered. We shared “thumbs up,” but I started remembering. There was a rush of thoughts and remembrances. There is not enough room in this short story to share them all. We have gone together to conventions, district and local meetings, hosted a state convention, held degrees, passed out Tootsie Rolls, worked on fish fries and pig pickings, served in honor guards, pulled weeds and served food on Parish Pride Day, and just had fun. Many times our families joined in. When I needed help with building a large storage building I asked for help and one brother knight-to-be, Drew Melvin, reminded me that the tree I cut down tree would keep growing, even if I build a building over it. Ouch. He then came over to my house and ground it up for me. I told Gene that I was going to work on the building and he said, “I can’t do much, but I will come on over and help as I can.” He did and we had a ball. We joked, cut wood, philosophized, shared stories, built walls and then raised them to form the core building. Gene was 84 years old! My granddaughter recorded the event by taking lots and lots of pictures. Here is a collage of some of them. (She tells me now that she does a lot of the things she does in our church and with youth, because of what she saw in my Brother Knights.) 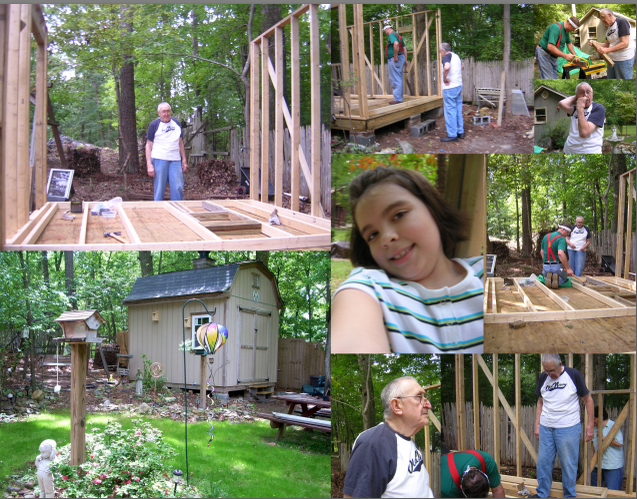 A week later, Paul Fiorentino came by to help square the walls and put up the siding. So, when you get tired and weary, remember that there is an eternity to rest, we Knights still have time for work with friends, family, and church community.